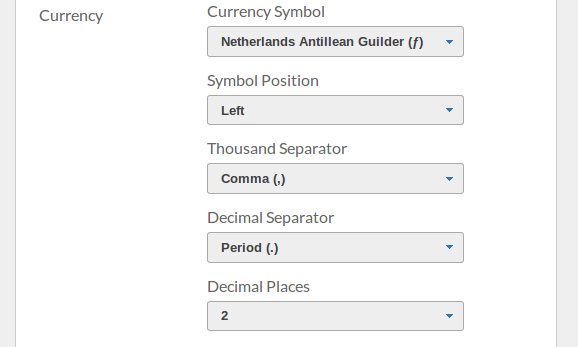 Many users had asked for the ability to change the currency symbol from ‘$’ to something else. We released an update last night to both the website and the IOS app that includes the ability to change the symbol, the thousand and decimal separators, the decimal places, and the location of the currency symbol. If you don’t see your currency symbol in your Preferences, please contact us and we’ll add it to the list. You can now select the account that you want a transaction to be on regardless of which account you are currently viewing. This makes it easier to correct mistakes if you accidentally add a transaction to the wrong account. We’ve relaxed some rules, such as not being able to create recurring transactions with a start date in the past. When creating a new transaction on the app, the default date will now be today only if you are viewing the current week. Otherwise, the default date will be the first day of the week you are looking at. 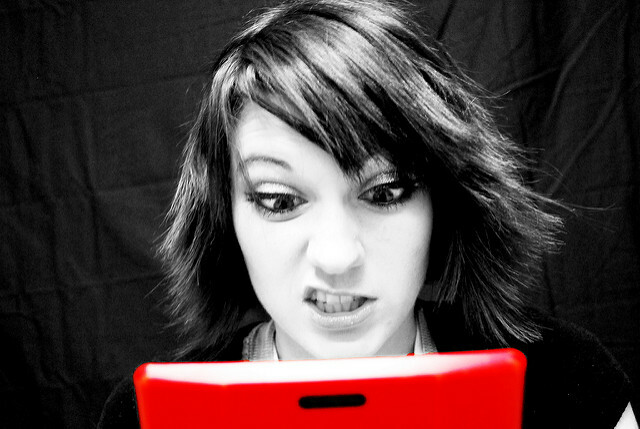 We fixed an issue on the app that caused items to be automatically deleted when doing a full left swipe. As always, feel free to contact us with any questions or issues. Credit card accounts are now supported! This means you can now track ALL of your spending. Before, if you used your credit card for certain things, the credit card itself was just a category and those expenses were lumped together into that category. Not anymore! The big difference between bank accounts and credit card accounts is of course, that when you add an expense transaction to a credit card account, the balance goes up, not down. There is now a new category called “Credit Card Payment” that is basically a transfer from a bank account to a credit card account. A credit card payment transaction will obviously bring the balance down of the From bank account, and it will also bring down the balance of the credit card account. We don’t however, calculate your credit card interest fees, so in order to sync your Kualto credit card balance with your real balance, you’ll have to enter those interest fees yourself as a transaction. The following changes are also included in this latest update. There is a new report called the Transfer Report. It gives information about all of the transfers that have occurred between accounts, within the specified time period. The Category Report now supports an “All Accounts” option, which means it can show your category spending across all of your accounts. By default, the “All Accounts” option is selected. You can of course, also choose to view the Category Report for a specific account just like before. You can change the default “All Accounts” behavior in your preferences. We’ve also added a “Default Report Period” option to your preferences, so you can pick the time period that reports should show by default. If you always like to view the next 12 months instead of the next 6 months, you can set this in your preferences so that you don’t have to change this selection every time you view your reports. We’ve just added support for multiple accounts! 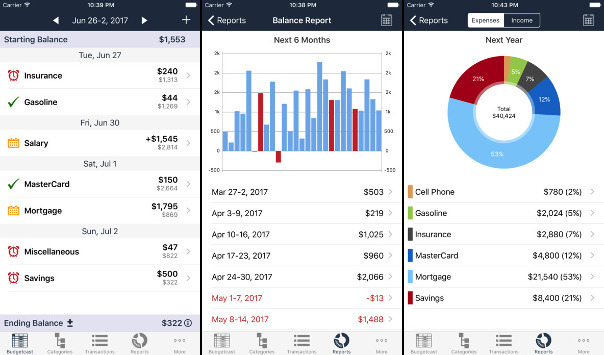 This means you can now track and forecast the cash flow of your checking account, savings account, business account, etc. There is no limit to the number of accounts you can track. When you select this category type you will be asked for the From and To accounts. The transaction will automatically appear on both accounts (as an expense on the From account, and as an income on the To account). Deleting the transaction from either account (From or To) will delete the transaction from the other. We really want to add support for credit card accounts. Credit card accounts are different than regular accounts in the sense that an “expense” on a credit account should increase the account’s balance, rather than decrease it. I really need support for credit cards myself, as I tend to use my credit card a lot to pay bills. Right now, when I look at my Category Report, I can’t see how much I’ve spent on restaurants because I tend to use my credit card for those types of expenses. The envelope budgeting system most people are used to using makes you write down your monthly income and then list out all of your spending categories and what you spend on each one, per month. It also makes most people hate budgeting, and for good reason. Who in the world spends on a monthly basis? Do you get paid monthly? Do you do monthly groceries? Most of us get paid semi-monthly or bi-weekly, we may do groceries once a week, and have random one-off expenses here and there. A system that forces you to think in terms of monthly spending just isn’t natural. Envelope budgeting is not very flexible. 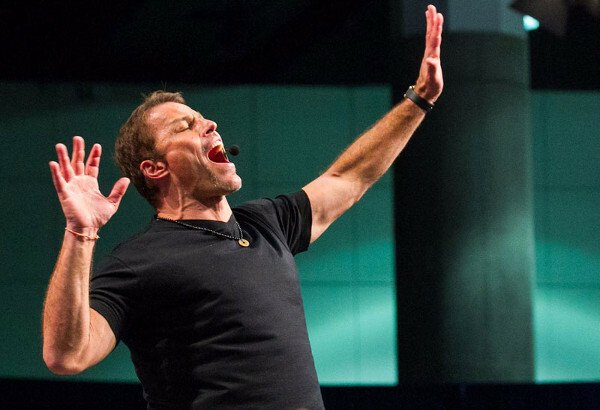 I’m a huge Tony Robbins fan. If you haven’t read Awaken the Giant Within, I urge you to make it a priority to read that book. If you’re familiar with Tony’s teachings you know and understand that more often than not we are our biggest obstacle. When I first created Kualto, my wife and I made the decision that to make things simple, we wouldn’t support cents. 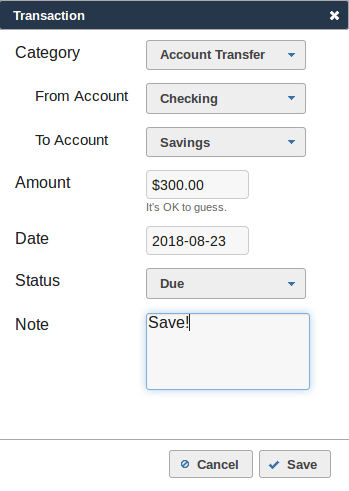 After years of using the cash flow forecasting method to manage our expenses using a spreadsheet, we knew that if you just rounded your expenses up or down, in the end you would always be within $2 of your bank account’s actual balance. So we instead provided a Balance Adjustment feature that allows you to adjust a week’s ending balance to make it match your bank account. That was enough for us. Then we released our iPhone app and got the following review a month later. We had completely forgotten about that decision we made a while ago. It made me wonder how many other users had decided not to continue using Kualto because it was lacking this feature. So there you go. Cents are now supported thanks to this reviewer. If there are any features you wish we would add, make sure to send us an email. And don’t forget to rate our app in the App Store. Whether positive or negative, we appreciate the feedback. I’ve added a new report, called the Balance Report. With this you can see what your account balance is expected to be for any week up to 3 years in advance! You can avoid overdraft scenarios and predict any problems many months before they happen. What’s cool about this is that it lets you quickly see what you can or can’t afford to spend on. 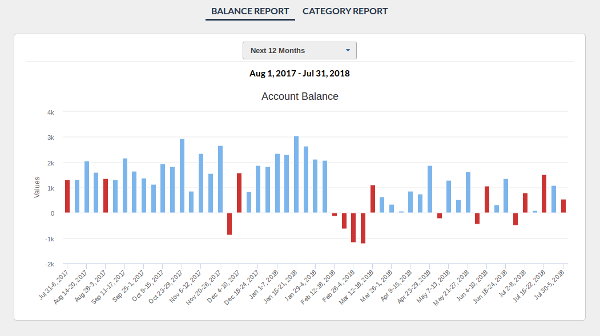 If for example you were thinking about adding a new monthly bill, you can create that repeating transaction and then go look at this report to see what that new monthly bill would actually mean to your account balance months down the line. You can also use it to see how much you can save. If you want to see if you can afford to save an extra $200 a month, create that repeating transaction and take look at your balance report. If you don’t see red, you are good to go! Each bar in the chart represents the week’s ending balance. When you see a positive red bar, it means at some point during that week, your bank account balance will go negative, but it ends positive. If the red bar is negative (below the 0 line), it means your balance will end negative on that week. If you want to see what’s going on in those future red weeks, you can click on them to be taken to the cash flow screen for that week so you can try to fix any issues. On the app or on the mobile site, you don’t click on the bars themselves. You click on the balances that are listed below the chart. The iPhone App is Out! The Kualto app is now available for iPhone. While we’ve had a mobile version of the site since the beginning, the app is faster and much more fun to use, and it does everything the website does. Make sure to review the app if you use it. I appreciate any feedback, whether positive or negative. Category Spending Reports are now available! 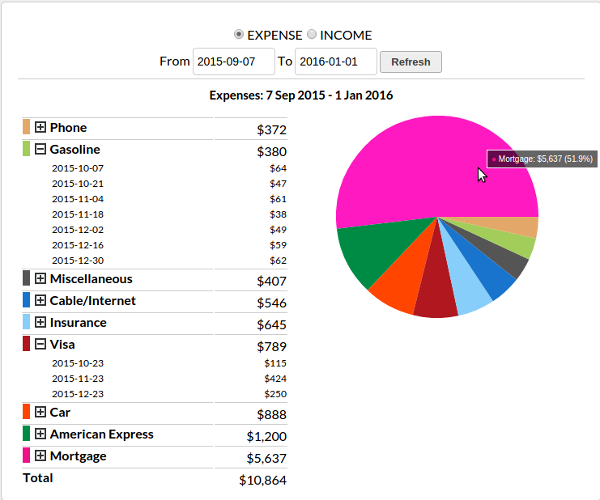 You can select a date range in the past or the future, and see a break down of your expenses/income for each category. You also get a nice looking pie chart showing you each category’s percentage. It’s great to be able to see how much you plan to spend on each category for an entire year, for example. 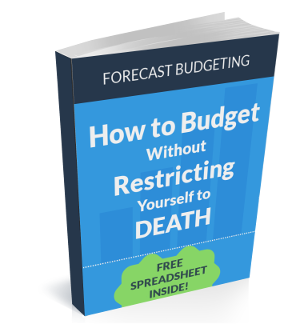 Download Our FREE Ebook + Spreadsheet! Sign up for our newsletter to download our ebook and spreadsheet, and start organizing your expenses.